Remove the national flag from local schools and do so on Flag Holidays. LIBERTARIANS DON'T HAVE AN ATTITUDE PROBLEM. NON-LIBERTARIANS HAVE A PERCEPTION PROBLEM. Don’t display the flag on National Holidays or other government-dictated dates. And don't pledge allegiance to the flag. Flag-wavers, flag-wearers and flag-worshippers hate America’s liberty, but love government and socialism. The flag is a symbol of their authoritarian government and of their own authoritarianism. They obsess about collective robotic chanting especially when it is led by government officials or performed daily in government schools (socialist schools). Flag-wavers, flag-wearers and flag-worshippers display their unflagging fetish for authority. They hate America and its freedom, but they love government, taxes, debt, bureaucracy, socialism and the growing police state. Their bizarre behavior is a paraphrase of Samuel Johnson: Patriotism is the last refuge of scoundrels. In America's earlier and more libertarian past, the flag was not displayed as obsequiously as it is today. The only reason that flags are displayed today at schools is because socialists in America wanted government to take over all schools and eliminate all of the better alternatives. They wanted to stamp out individuality and they wanted to make everyone the same, even to the extent of robotic chanting in unison to worship government and socialism. 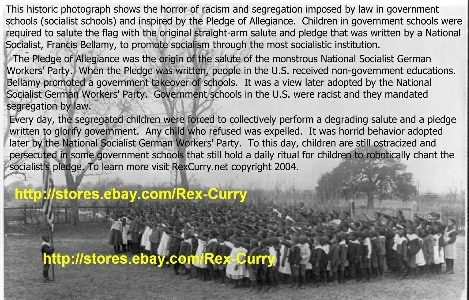 If government's schools (and the media) told the true history of the pledge, then no child would chant it. If all Americans knew the truth, then the pledge would cease to exist and the flag would be removed from all schools. Constitution Day, September 17th, commemorates the 1787 signing of the U.S. Constitution. The creation of the flag is cited as either 1776 or 1777. During America's early years, individuals did not engage in flag displays at their homes or schools, and they did not pledge allegiance to the flag. When the Constitution was written, and for a long time thereafter, the government did not own and operate schools as it does today and there was no involvement in education by the federal government. There were no laws for leading children in robotic chanting of a pledge of allegiance to the federal flag in classrooms each morning for 12 years of each child's life. That bizarre pledge and flag practice (shunned by every other country) spread in 1892 when the Pledge of Allegiance was written. Another suggestion from a fan is to fly better flags on flag days. She writes: "In my flag collection, I have the three most familiar 'Colonial Rattlesnake Flags,' to wit: the Gadsden Flag (yellow with curled rattler and the 'Don't Tread on Me' -DTOM- slogan); Culpepper (white one with curled snake and 'Liberty or Death' slogan as well as DTOM), and the First Navy Jack (striking snake). This year, for Flag Day, I'm going to fly one of my Rattlesnake Flags ... the 'true flag of freedom.' Or maybe all three. And I'd like to propose, as this week's action, that we all do the same. Fly the flag of FREEDOM this year on June 14!" Aaron Zelman and Claire Wolfe (of Jews for the Preservation of Firearms Ownership) have written a NEW pledge. It has been called "the Freedom Pledge." "I pledge my honor to the Bill of Rights, our precious national treasure. "As the Bill is a fortress against tyranny, I will battle all tyrants. "As the Bill protects liberty, I will live free. "As the Bill guards rights born within all humanity, I will defend the freedoms of future generations. what can be, I honor all of the Bill of Rights for all mankind."